Can you believe that Christmas is right around the corner? Get your little ones ready for the holiday season with these 43 creative Christmas crafts for kids. The children will love making all these fun decorations, ornaments, and other goodies to get them in the holiday spirit. Plus many of these crafts would make terrific Christmas gifts from the kids as well! From Christmas Trees to snowflakes and wreaths, there is something here for everyone. You will find easy crafts perfect for toddlers as well as more advanced projects for older children. To view the complete step-by-step directions for each of these Christmas crafts just click the link. Happy crafting and have a very merry Christmas! 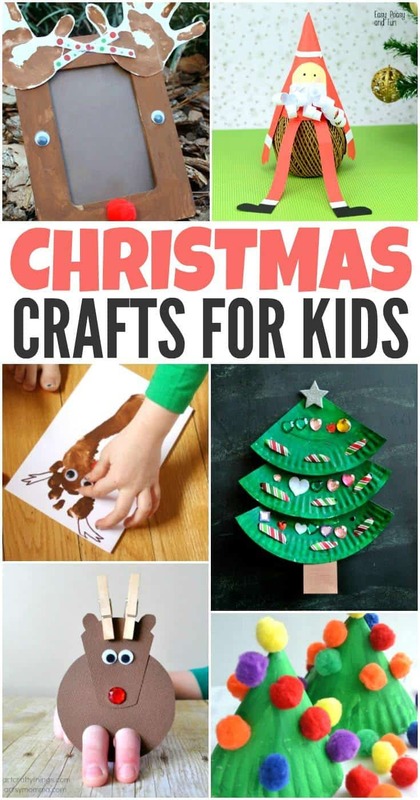 Which of these 43 Christmas crafts for kids do you plan on trying this year?! We would love to hear from you in the comments below! These ideas were so cute that I pinned them on my Craft Pinterest board. I am going to try some of them with my grandkids. wow a huge list of projects that look pretty simple!! This is such a great list of crafts I can do with the kids! I’m going to try all of them, but the first one I’m going to do with them is the Easy DIY Felt Christmas Tree Ornament. Thank you for sharing. Great ideas for the little ones. I loved making things for christmas as a child. So many ads I can’t read the crafts, which is disappointing. Oh, these crafts bring back memories of my kids when they were little. I loved those days! These are great ideas cant wait to do them next christmas! Such great craft ideas. I will save these for next year. We do a lot of crafts during the holidays.